For years I've used a Behringer 1204 small format mixer on my desktop for simple monitoring and routing while mixing and recording. For years I have been frustrated with the lack of features and I/O options. After a recent episode of frustration involving the dual function of the mute switches and Post-Fader axillary sends, it occurred to me, why not just build my own mixer? How hard can it be? 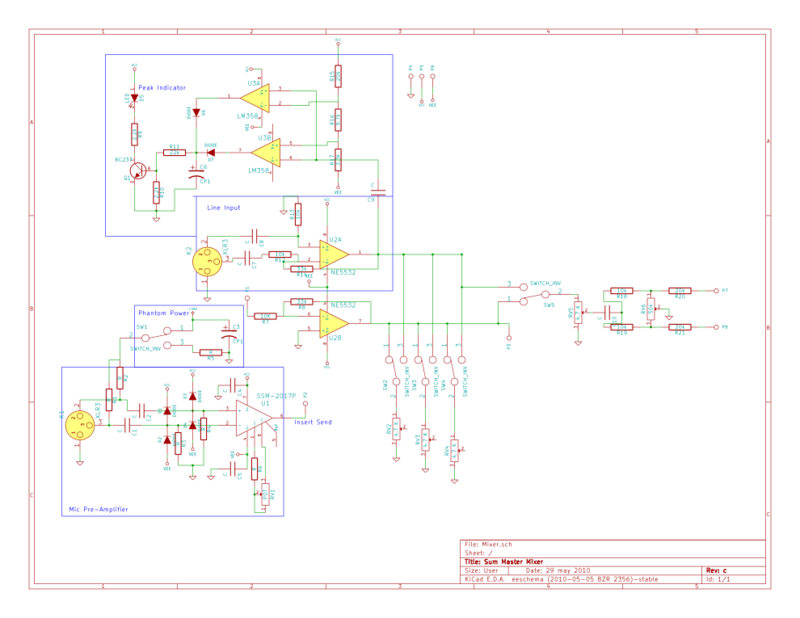 After several revisions to the schematic and many iterations of the board layout, its all finally done. The whole package looks and sound great. I had the pleasure of using it to track some vocals some weeks ago and the compressor really imparted a warmer sound. I think I may have to work out a way to incorporate some sort of decibel or clipping meter to prevent over driving the 5532. That said, the overdrive isn't really distasteful. After finding myself often wanting of an analog compressor in my rack of gear, I ran across the simple compressor design from the old Electronics Projects for Musicians(EPFM) book. It uses a couple op amps and a Vactrol (or LDR Optocoupler) to compress the audio signal. It was my pleasure to be on set helping with the production of Calling all Voices and the "Mother Earth" music video. This production was a great experience and a great opportunity to meet and work with some amazing people. In tribute to creative content being broadcast on the radio at large. I gathered together a group of friends to revisit the radio drama of ole'. The drama of choice? The classic "War of the Worlds" in abridged form. Our antics are included bellow in recorded mp3 form. Quick, Automated, Incremental backup with rsync and ssh. Working in the multimedia field. I live and die by data management. It's easy to be a little to quick with the delete key. Even with the best data organization strategies, it's all for nothing when a drive fails. This is why i've set our in search of a reliable way to incrementally backup my data. Read more about Quick, Automated, Incremental backup with rsync and ssh. Is twitter taking over? I think not! This past month as been jam packed with stuff for me: Moving, settling into the new digs, painting, wiring for a network, four classes at school, developing software for work, moding my dumpster destined x-box, finishing Out of Control, pre-pro for a new short? etc. Read more about Is twitter taking over? I think not! Day two and three of the studio rebuild consisted mostly of placing the gear into the racks and wiring everything up after all the snakes and looms had been run and prepped. The layout of the outboard gear is crucial. By grouping similar gear together one can simplify the usage of looms and snakes. For example, by dedicating one rack to dynamics. A single snake can be dedicated to dynamics and run directly to the rack instead of stretching fan-outs between racks and running extensions and such. Also, it is very important to realize how much heat certain gear generates. I've been helping out in the studios at Ai to rebuild the racks of gear and simplify/tame the many snakes, looms, and rat nests of cable. Here are some pics from Day One, you see the many fans of cable have been lain out on the floor for more work room inside the rack. The ultimate goal here is to keep all of the looms out of the floor from in front of and from behind the rack. The solution? We run all the cable under the rack, bringing the DL looms out from under in the back to mate with the fannouts for connecting to the gear.